Surf News Network, 2 January, 2015. In 2013, Mercedes- Benz Portugal and BBDO developed the MBoard project, a marketing campaign based around the design of the ultimate surfboard for Garrett McNamara to ride massive waves at Nazaré. The idea behind it was to reflect the 3 pointed star of the iconic Mercedes logo that represents land, air and sea on to several surf boards. The campaign was extremely successful, earning many advertising and communications awards, overall 20 in 2014, which showed the huge success the project became on a national and international level. With the global success of the MBoard Project and McNamara’s ongoing adventures it was a no brainer for Mercedes-Benz to sign a contract with Garrett in order to be part of the brand’s global marketing campaign. The MBoard Project has expanded since 2013, and is now making a series of boards with different materials. The first one was a tribute to Portugal, made of 100% Portuguese cork provided by Amorim Cork Composites. The second one was made from high density foam used to manufacture aircraft wings, a material Garrett himself has brought all the way from Varial Surfboards in California. The idea behind this new material is to achieve maximum flexibility and to absorb the vibrations when surfing waves over 60ft in Nazaré. In December 2014 a massive swell hit the coast of Portugal generating massive waves and the perfect opportunity for McNamara to test the foam board’s performance. 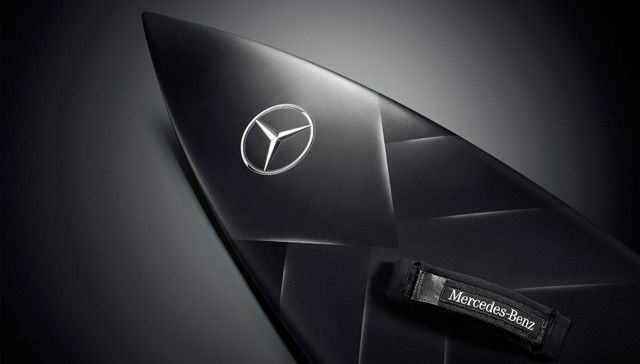 In the words of Jorge Aguiar, Marketing Manager at Mercedes-Benz Portugal: “ The MBoard Project is a unique and innovative marketing approach to establish a real partnership with a great human being – Garrett McNamara – enabling Mercedes-Benz to be part of his extreme life, in land and in the water. We hope that we can contribute to find the best technologies for the best tow in board for Garrett.